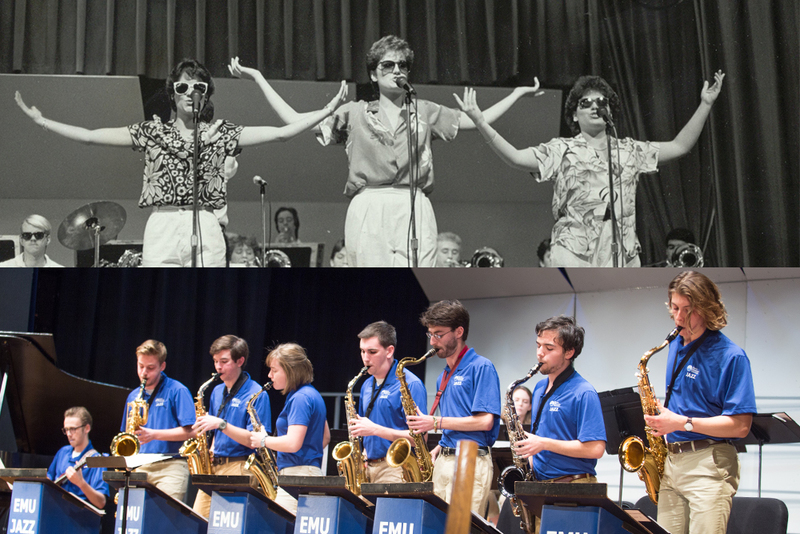 Four a cappella ensembles, a jazz blast from the past, and hymn singing will all be part of the Eastern Mennonite University Homecoming concert at 8 p.m. on Friday, Oct. 12 in Lehman Auditorium. 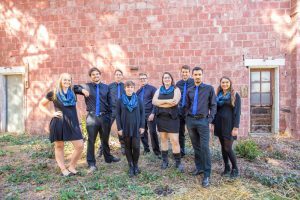 Harrisonburg a cappella groups Cantore, Shekinah and Striking Accord will each perform, as will EMU’s student ensemble Emulate – and the Bubble Sisters with the EMU Jazz Ensemble. All will join ranks for the evening’s final number. Read all about Homecoming and Family Weekend 2018! In between sets, alumni will lead the audience in singing hymns. Tickets are $10 in advance/$15 at the door. EMU students and children 12 and under are free. Register for this and other events at www.emu.edu/homecoming. The Bubble Sisters – at Homecoming they will include Ruby Kauffman ‘87 Hostetler, Candace Ross ‘87 Ross-Cleary and Wendy Noll ‘86 Martin – performed with the EMU Jazz Band beginning in the early ‘80s under the direction of Professor Stephen Sachs. A means of differentiating the EMU jazz ensemble from that of Goshen College, the trio added vocal solos, harmonies and scatting. By 1993, their name had changed to the Swing Sisters. The current Jazz Ensemble is directed by Robert Curry. Since 2002 the all-male Cantore has performed over 300 times and released six albums. 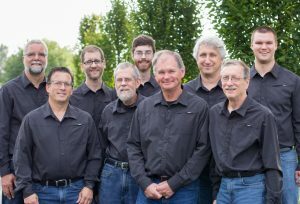 Its varied repertoire includes standard religious choral works, bluegrass gospel, spirituals, hymn arrangements and more. Current members are Don Bomberger ‘72, David Clymer, Jim Hershberger ‘82 MAC ‘97, Sam Kauffman ‘12, Phil Kniss ‘82, Robert Maust ‘72, Jeff Myers ‘89, Jeremy Nafziger ‘91 and Jeffrey Smoker ‘16. 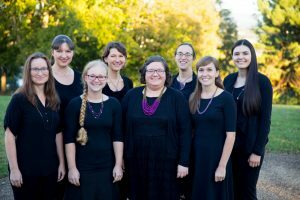 Shekinah assembled in 2003 for an EMU chapel service, and since then has since performed numerous concerts and released seven albums of songs such as “Here Comes the Sun,” “O Magnum Mysterium” and “How Deep the Father’s Love For Us.” The all-female ensemble took second place in the April 2018 Shenandoah Valley Sing Off, and currently is comprised of Greta Shenk ‘10 Bucher, Maria Clymer ‘00 Clymer Kurtz, Katie Derstine ‘05, Caitlin Holsapple ‘16, Chelsea Mast ‘09, Ranene Schrock ‘98 Ropp, Selah Shenk ‘11 and Joanna Souder ‘04 Showalter. Striking Accord formed earlier this year. Its debut performance featured music from a variety of eras and genres from the Renaissance to modern pop. 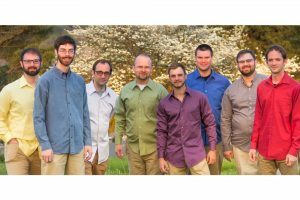 The all-male ensemble includes Jon Bishop ‘17, Sam Kauffman ‘12, Joel Rittenhouse ‘13, Justin Rittenhouse ‘12, Clay Showalter ‘02, Jeffrey Smoker ‘16, Jared Stutzman and Joel Thomas. EMU’s Emulate Chamber Ensemble is directed by Professor Ryan Keebaugh, whose conducting has been described as “expressive, concise, insightful and sensitive.” The auditioned group has performed at the Washington National Cathedral, and currently includes Asha Beck, Josh Holsapple, Ally Mankamyer, Luke Mullet, Karina Pidroutchniak, Anna Ressler, Partha Roy, Joseph Seitz, Leah Wenger and Lucas Wenger. The EMU Jazz Ensemble includes students Joshua Ayers, Bruce Cypress, James Dunmore, Leah Lapp, Jonathan Larsen, Joshua Overacker, Kaitlin Parker, Madalynn Payne, Sarah Ressler, Avery Trinh, and alumni Craig Hofstetter, Evan Knappenberger and Sam Kauffman. Read about their 2017 revitalization.